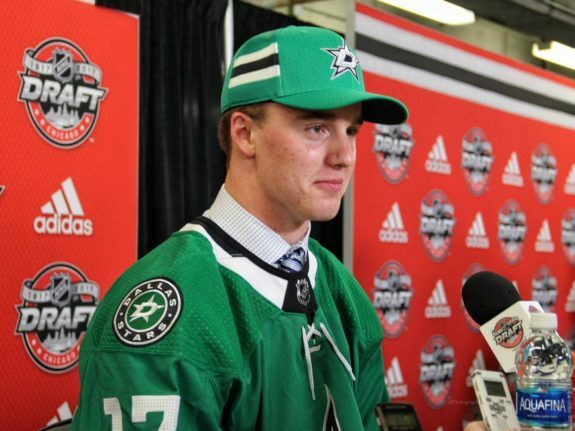 The Dallas Stars have signed Jake Oettinger to an entry-level contract (ELC). The netminder has decided to forgo his senior year at Boston University for a taste of NHL hockey. The ELC will come into effect at the beginning of the 2019-20 campaign, meaning Oettinger cannot join Dallas for the remainder of this season. However, he will be joining the Texas Stars of the AHL for an amateur tryout. It will be a great opportunity for the young crease dweller to hone his game and adjust to life down south. Prior to being drafted 26th overall by the Stars in the 2017 NHL Entry Draft, Oettinger completed his freshman season with the BU Terriers. The netminder accumulated a 21-11-3 record with four shutouts. He tacked on a .927 save percentage (SV%) and 2.11 goals-against average (GAA). In the NCAA West Regional Final against North Dakota that season, Oettinger backstopped the Terriers to a 4-3 double-overtime victory. He made a whopping 56 saves. In total, BU had allowed 145 shot attempts – it was a game they shouldn’t have won yet did due to their then-19-year-old goaltender. They would eventually lose to Minnesota-Duluth in overtime in the next round of the NCAA Tournament. Oettinger had a solid sophomore season, as well, going 21-13-4. With a 2.45 GAA and .915 SV%, the netminder helped his team raise a Hockey East Championship banner to the rafters. They would then go on to make a run at a national championship but lost in the Northeast Regional Final to Michigan. Still, Oettinger was proving that he could come up big for his team in big games. The Terriers had an up-and-down 2018-19 season, and thus their starting netminder’s record suffered. The 21-year-old went 16-16-4 during his junior year. However, he performed well individually, nabbing a 2.45 GAA and .926 SV%. The goaltender was able to steal games for his team when the offense wasn’t holding up their end of the bargain. However, Oettinger was left hung out to dry by his defense some nights. While his record wasn’t impressive during his last season as a Terrier, it’s hard to find many BU losses that were the goaltender’s fault. Now that the dust has settled, Oettinger inked a 58-39-11 record throughout his collegiate career. He also tied a school record with 13 shutouts as a Terrier. He has etched his name in Boston University history and seems ready to move on to the next challenge. The Stars have quite the age gap within the crease. Ben Bishop and Anton Khudobin are both 32 while Landon Bow, a 6-foot-5 netminder who has appeared in two NHL games this season, is 23. This seems to give Oettinger a great opportunity to impress and could lead him to earn a permanent role sooner rather than later. The 21-year-old has proven that he has plenty of skill with which he could gain traction in the world of professional hockey. He is excellent when going post-to-post and has made some exceptional glove and blocker saves. He also stays strong when there is traffic in front of him. In those situations, he is able to track the puck and squash it for a whistle. When provided an opportunity at BU, Oettinger capitalized. Goaltender Connor LaCouvee transfered to Minnesota State for his final collegiate season for more playing time – he had only appeared in 32 games over the course of three seasons with the Terriers. The door was open, and the Dallas prospect nabbed the starting role despite competition from other goaltenders. By some, Oettinger is considered to be amongst the top goalie prospects in the league. While it tends to take a few seasons at the professional level for netminders to fully flesh out, there is no reason to doubt that the Lakeville, Minnesota native has a high ceiling. He could very well be the Stars’ next starter if he doesn’t plateau upon reaching the show.